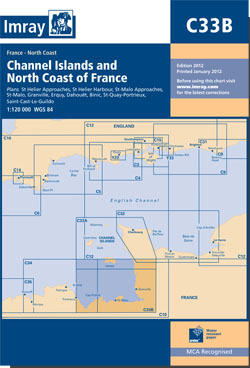 Shows the south coast of Jersey, and the associated west coast of the Cotentin peninsula, the Baie de Mont St Michel and the north coast of Brittany as far west as St Quay Portrieux. Scale: 1 : 122,600. One-minute gridlines. Larger scale plans of St Helier approaches, St Helier harbours, St Malo harbours, St Malo approaches, Granville, Erquy, Dahouet, Portrieux and Binic. Tidal stream diagrams.